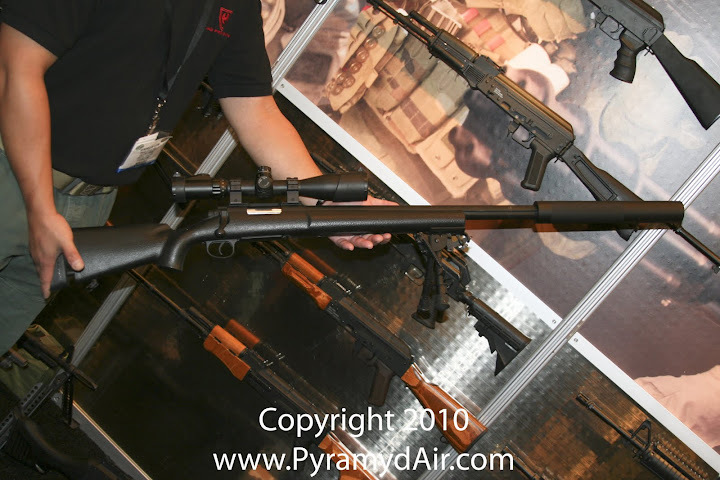 Hendrix De Leon of JAG Precision shows off the Echo1 M28 Airsoft Sniper Rifle with a new MadBull suppressor prototype at Shot Show 2011. 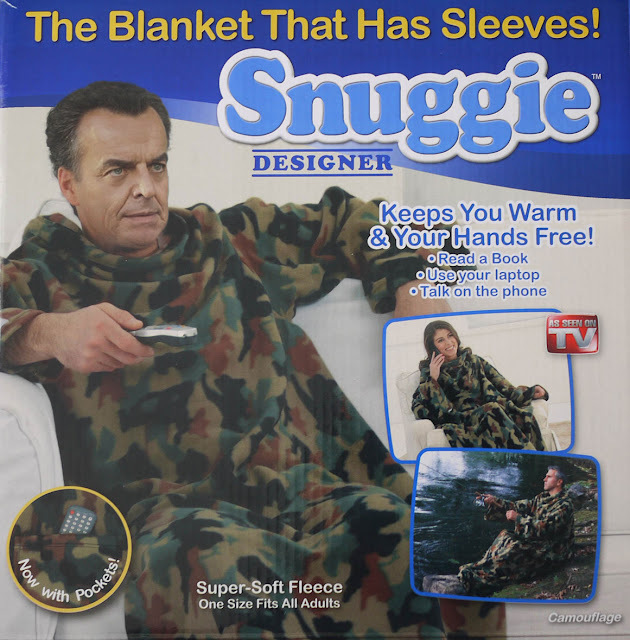 As I sit here in my combat snuggie, writing up more of my reports on the 2011 Shot Show, I am continually reminded of how much fun I had!!! Heck, I didn't even mind that the carpet in my hotel room was so saturated in animal urine that you couldn't even tell that it was a smoking room (they told me they were out of non-smoking rooms, even though I booked ahead). My battle buddy (Todd) and I were just having waaay too much fun. Anyway, I thought I might share a brief bit on the spring-powered Echo1 M28 Airsoft Sniper Rifle. We'll get to the Airsoft minigun in a minute. 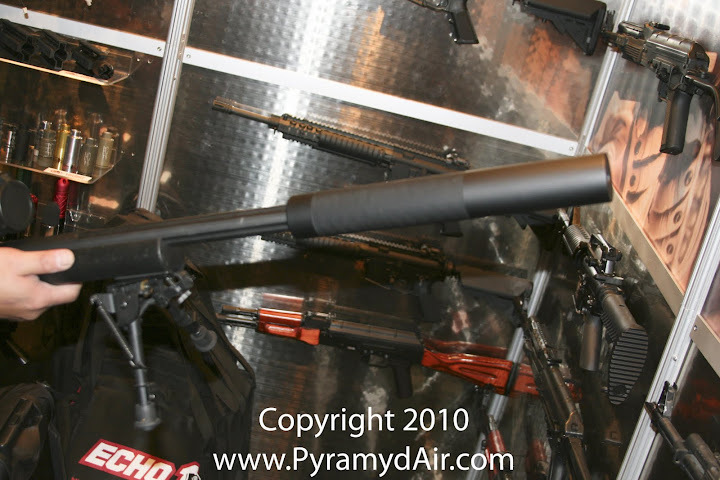 I am generally not impressed by too many Airsoft spring sniper rifles, and thought the Echo1 model would be no different, however, it had my full attention as soon as I saw the new mock suppressor that Mad Bull is making for it. Then, once I picked it up, I REALLY started looking at it like we might have a situation on our hands here. It didn't feel like some of the cheap plastic springers I've had experience with in the past or seen on Airsoft fields. It was solid and sturdy, and appears to be on par with just about everything else Echo1 has been releasing lately, which is nothing short of awesome. They've apparently been working pretty hard lately, trying to put together a nice array of new replicas. Here's a close-up of the new MadBull suppressor for the Echo1 M28 Airsoft Sniper Rifle, which actually covers a portion of the barrel and then attaches to the flash hider about half-way into the suppressor (Special flash hider comes with the can, if I recall correctly). This gives the rifle the look of having a shorter barrel with a sick can attached to it. Speaking of the barrel, you can see a bit of the fluting that was done to the outer barrel. To the best of my knowledge, fluting of the barrel is done primarily as a way to reduce unnecessary weight from the rifle, but I could be completely off. If you think about it, the barrel starts as a cylindrical metal piece, and then portions of that metal are removed. Less metal, less weight. Makes sense to me. I also happen to think a fluted barrel looks legit, too (That's what she said). Also in the photo above, you'll notice a nice Harris-style bipod (my favorite kind, and it actually has nothing to do with my last name also being Harris). I just think they are the most functional and I don't mind the extra weight they add to the gun. They look better than those little dinky ones you'll see on some Airsoft guns, too. Anyway, that Harris-style bi-pod actually COMES WITH THE Echo1 M28 in the box!!! 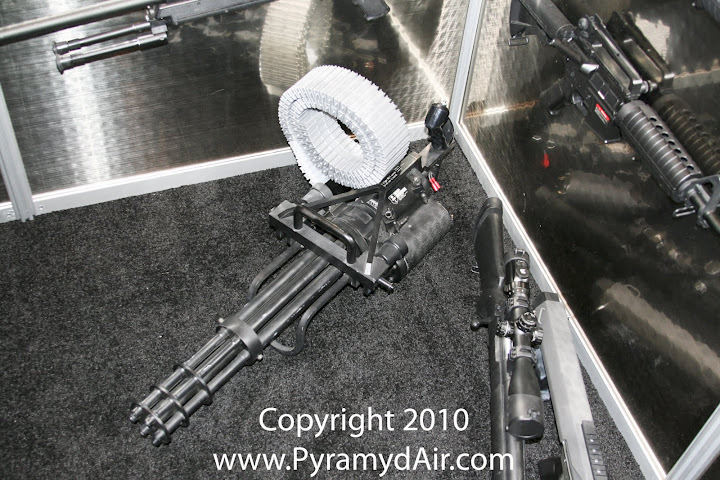 You don't see a whole lot of manufacturers able to include a high quality rifle AND some solid accessories, like the bi-pod, together in one VERY affordable package (under $200 at Pyramyd Air). It's one thing to see a picture of the Echo1 M134 Minigun, but it's quite another to see that Airsoft heavy machine gun in person. So I had to snap some photo documentation of it. My brother & I were looking at this photo after the show, noticing that it was next to the M28 there, that you can see on the right, and we sort of both thought the same thing out loud at the same time. It was one of those epiphany moments where we both said, "We need a Minigun for our fireteam!" Think about it. If one of us rolls the Echo1 M28 Airsoft Sniper Rifle (probably me cuz I dig the long rifles), and the other runs the Airsoft M134 Minigun (probably Todd cuz he digs the holding down of the trigger for long bursts even when it's not necessarily appropriate cuz it feels so good!) with a 125,000-count rice bag full of BBs, the OPFOR is going to have a hell of problem on their hands. It just makes so much sense it's like science or something! I don't know. Maybe I'm just being ridiculous. Or maybe I'm just thinking outside the box (Probably more-so towards the "ridiculous" end of the spectrum though). I love Airsoft (more thoughts).